The All Serv Loyalty Scheme has been running for a number of years. It is a great way to keep down the cost of motoring and our way of repaying your loyal custom. 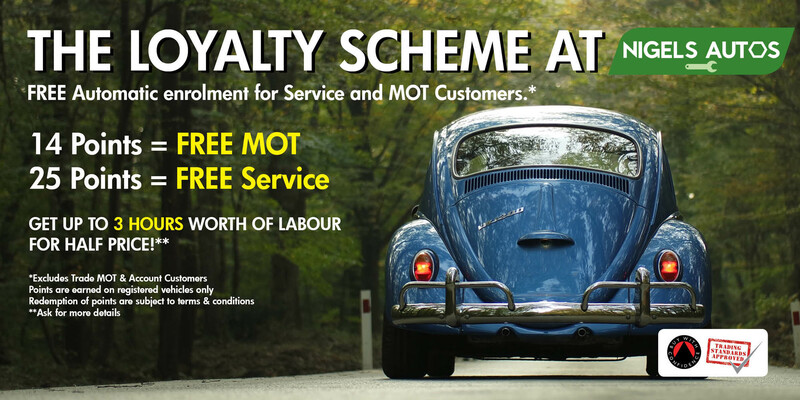 It is totally free and we have had literally hundreds of customers using their Loyalty Points to make savings on MOTs, Services and Major Repairs. Points are awarded for a wide range of everyday repairs as well MOTs, Services and Air Conditioning work. You can also add multiple cars to the card to build up your points total more quickly. You will automatically be enrolled on the Loyalty Scheme and get your Reward Card when you have a Full Service performed at All Serv. We will add more points to your card each time you have qualifying work done. Each time you have qualifying work completed you will earn points that you can collect and eventually exchange for FREE work on your car. There is a wide selection of regular maintenance and repair jobs, including the MOT, that qualify for earning reward points. Each job has its own points value and these are recorded on your card when you have the work done. A full list of qualifying jobs and the points they earn is given below. Why can more than one car be registered on the Reward Card? Simply to enable you to earn more points more quickly, making it easier reach the required amount of points for free work. Can the Loyalty Scheme be used in conjunction with a Discount Card? Yes, you will still receive your full discount on all work if you are a Corporate Card Holder. This is an extra bonus offered to our loyal customers. When can Reward Points be redeemed for FREE work? They can be redeemed at any time providing there are enough points on the card for the work required and you can continue to collect points on the same card until you have enough for any further work in the future. What can Reward Points be redeemed against? Below is a list of work that you can exchange points for and the current number of points that you will need to have this work free of charge. You can have this work completed on any car that you have registered on your reward card. What happens when some points have been redeemed on a card? Unless all of the points on your Reward Card have been used you can continue to collect points until the card is full. Once it is you get another card to continue to collect points until you are ready to redeem them. Unfortunately no. Loyalty points have no cash value. However you can now use Loyalty Points to cover up to 1.5 hours of labour cost on individual repairs where the total labour time is over 3 hours. We are sure you will welcome this extra help in reducing large, unexpected bills as well as helping keep down the cost of regular maintenance and rewarding you for your continued custom. You will be rewarded with the following points every time you have qualifying work performed on a registered vehicle. * During the year or for promotional purposes we may change the number of points shown in the above tables.